Your set-top box has been upgraded to receive a new free TV Guide which you can now use. This guide allows you to view 14 days of TV listings, add reminders and search for programmes. The guide also provides a new Teletext news and information service. From now on, please leave your set-top box in standby when not in use, INCLUDING OVERNIGHT. 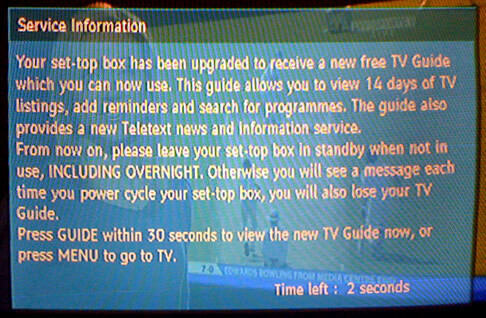 Otherwise you will see a message each time you power cycle your set-top box, you will also lose your TV Guide. Although your Digital Receiver can remain powered up continuously without harm to the television or itself, we recommend you turn it off at the mains overnight or when your receiver is not going to be used for long periods of time. This will save energy (and your money). This contradiction is possibly due to the software being produced by one company and licensed to many different hardware vendors (and most likely the cheaper makes), meaning this message is beamed into millions of homes across the country. When you consider that estimated annual CO2 emissions from set-top boxes left on standby is 60,000 tonnes alone (source), the message accompanying this update not only contradicts the advice given by governments and energy conservation organisations, but defies common sense too. Next A Bomb in Littlehampton?